This delicious sweet crab's meat "Starter " is easy to assemble and will sure add the wow factor to your Christmas lunch and leave you with plenty of time to enjoy the festivities. As long as you use quality ingredients, it will taste fantastic too. 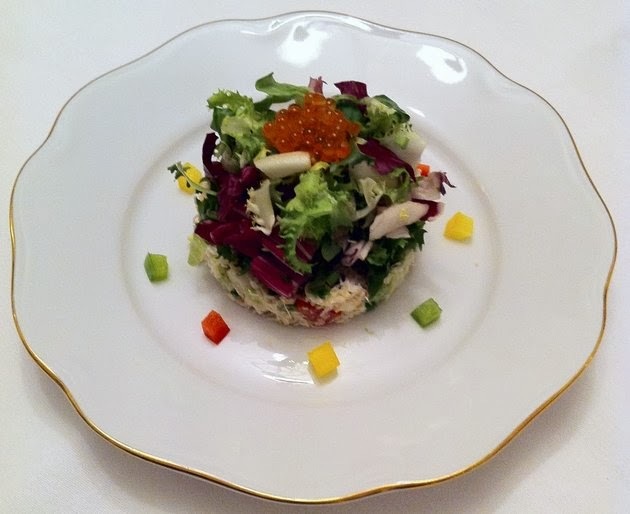 Here , I am using Castletownbere Crab meat and Goat'sbridge award winning trout caviar. Blanch the asparagus in salted boiling water for 2 mins. Remove and refresh in cold water. Cut the tips to 3 “ in height and slice in half. Finely chop the bottom stems. Dress the frisé with a little olive oil & lemon juice. Mix some of the mayonnaise with the crab meat & the chopped asparagus stems until it is well coated but still firm. Place a chef ring in the middle of your plate, layer some of the crab meat mixture, press down with the back of a spoon. Top with the dressed frisé. Remove the mould and surround with the halves asparagus tips or very small dice of mixed peppers as in the photograph. Chef Tips : The Crab meat mixture can be prepared in advance and chill until needed. But only dress the salad leaves, when you are ready to serve.